I drew this card on July 13. Here she is again. Last time, I’d equated this card with extreme empathy, if not clairvoyance and psychic attunement. She governs her people by feeling what they feel, by being sensitive to their needs. I’d also learned last time that this card can indicate female hormonal problems, or addictions. I’d determined that inverted would likely indicated the troubled spots, whereas upright would indicate the more positive attributes. 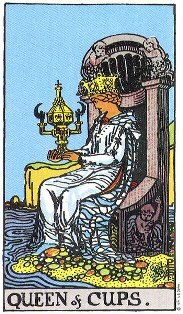 I also remember reading somewhere that this card could represent a female alcoholic (which ties into the addiction definition), or that it can represent the “other woman” in an affair (which I’d never heard before and tend to resist). Ah, I remember… that last bit was from Solitary Witch by Silver Raven Wolf, which I’d included in the description the last time I drew this card. Based on my recent study subjects (palmistry, numerology, astrology, etc), and my recent writing of The Winds of Change, the fact that I’ve become more solitary – and yet, through that solitary action, more “connected”, I think this card is right on time. In fact, last time I drew her, she came up with the Quiet Time Fairy Oracle. I’m learning to stop resisting the flow of life, to stop being emotionally “bowled over” when things don’t go the way I’d hoped or planned, such as with the recent plans to move that fell through, or in relationships. I’m focusing much more on honing my skills and using my gifts, on doing what I’m supposed to do. Rather than see the world through my own human eyes, I’m looking at it through the third eye… allowing myself to be directed by the Universe instead of trying to bend the Universe to my own will. In an odd sense, I’m becoming much softer by thickening my own skin.